An EU report suggests Jerusalem has reached a dangerous boiling point of ‘polarization and violence.’ The account, published by the Guardian, says the EU may take a tougher line against Israel as it continues to build illegal settlements in the city. The report is prepared annually by the European countries' missions in Jerusalem, who advise EU foreign policymakers. The leaked text, obtained by the Guardian newspaper, describes the emergence of a “vicious cycle of violence … increasingly threatening the viability of the two-state solution,” which it says has been stoked by the continuation of “systematic” settlement building by Israel in “sensitive areas” of Jerusalem. The UK publication states that according to well-informed European sources, the report now being discussed in Brussels shows that European governments are considering introducing additional measures against Israel. 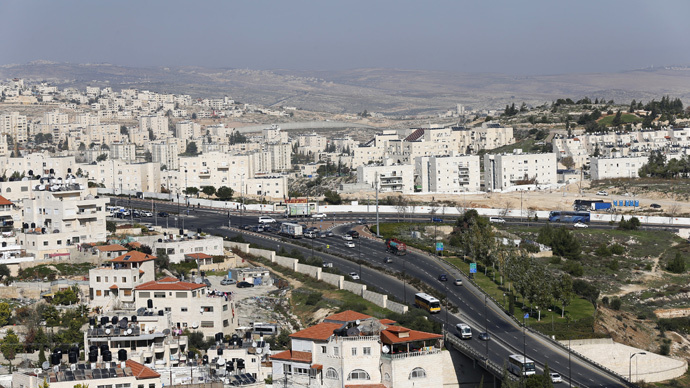 This is due to the country’s stance of continuing to build settlements in disputed areas in Jerusalem. The report comes hot on the heels of the recent Israeli election, which saw conservative Benjamin Netanyahu elected for a fourth term. During campaigning, the Israeli Prime Minister said there would be no two-state solution to the Palestinian question, and he also advocated continued settlement building in disputed territories, including East Jerusalem. Both the US and EU have called for the creation of a two-state solution as the only way to push the peace process forward. The report, citing European sources, states that the EU is considering introducing a tougher line against Israel regarding issues such as settlement building, while the US has said it will reassess its relationship with Israel following Netanyahu’s re-election. It highlights a number of causes behind the escalating situation in Jerusalem, including the kidnap and murder of a Palestinian teenager in the eastern part of the city by Jewish extremists. The killing happened in early July, days before Israel launched a military operation in Gaza, which left over 2,200 Palestinians dead. The EU report also cited incidents involving Palestinians targeting Jews in fatal attacks. The report also blamed continuing forced evictions of Palestinians from their homes and house demolitions by Israeli security forces for escalating the situation as well as tensions concerning the Temple Mount complex. Israel slammed the report saying, “This is so extremely one-sided a report that it distorts reality beyond comprehension,” an Israeli government spokesman said, speaking to the Guardian.